Dual-fuel engine is the diesel engine that can run on both gaseous and liquid fuels. When running in gas mode, the engine works according to the Otto process where the lean airfuel mixture is fed to cylinders during the suction stroke. Efficiencies exceeding 47% have been routinely recorded. When running in diesel mode, the engine works according to the Diesel process where the diesel fuel is fed to cylinders at the end of compression stroke. The engine is optimised for running on gaseous fuels and diesel fuel is used for back-up fuel operation. 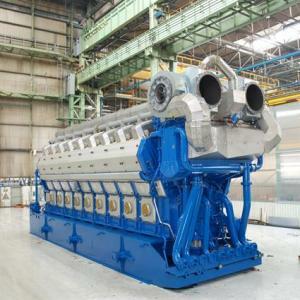 The DF technology enables the engine to be operated on either natural gas, light fuel oil or HFO. Switching between fuels can take place seamlessly during operation, without loss of power or speed. The engine is designed to have the same output regardless of the fuel used. LNG shipping : Since the beginning of the 21st century, LNG has been very much in the picture. Oil majors are expecting that LNG will be taking a much larger share in the energy mix in the next 25 years. The LNG value chain necessarily involves LNG shipping. It’s in this part of the value chain that we’ve seen some major technology changes recently. . The introduction of the dual fuel diesel electric (DFDE) LNG carrier (LNGC) and the slow speed diesel driven LNGC with onboard reliquefaction (DRL) are radical departures from the currently dominant steam turbine drive technology. The introduction of the dual fuel diesel electric drive systems could also open the door for dual fuel gas turbine electric (DFGTE) propulsion systems, as they are based on the same electric drive concept. The introduction of electric drive in LNGC propulsion might seem like a radical step, but in fact the move toward electric propulsion was an evolutionary process. With the LNGC growing in size, the onboard power requirements increased so much that 440 V installations couldn’t handle the load safely. This led to the introduction of medium voltage switchboards and pumps motors. This familiarization with medium voltage systems was the first step towards electric propulsion. In cruise vessels, medium voltage propulsion systems were introduced more than a decade earlier and have since gained an excellent track record.